according to some scientists. They are very bizarre animals in all regards; they have a skull but lack a spine, and they have two brains. Almost blind, they feed at night on the carcasses of large animals (fish, cetaceans etc) which fall to the sea bottom. They owe their aloeslime eelal nickname to the fact that they produce a slimey substance to damage the gills of predatory fish; as a result, they have virtually no natural enemies. 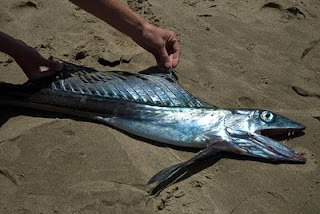 The lancetfish has a very obvious alœprehistorical appearance, with those fierce-looking, sharp teeth on its jaws and the sail on its back, reminiscent of that of some dinosaurs (although, in the lancetfish the sail is actually an enlarged dorsal fin). Even its scientific name has a dinosaurian sound to it (Alepisaurus ferox). 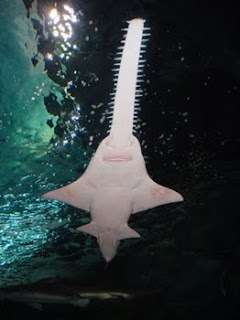 Up to two meters (6'-6") in length, this predator is found in all the oceans except for polar regions; very voracious, it feeds on smaller fish and squid, and has known to feed on members of its own species sometimes. Belonging to the ancient group of the Osteoglossids, these fish already existed in the Jurassic period. Today, they are found in the Amazon, and in parts of Africa, Asia and Australia. 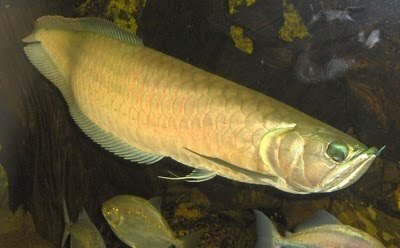 Sometimes kept as exotic pets, arowanas are voracious predators that feed on any small animal they can catch, including birds and bats which they catch in mid flight (they are able to leap up to 2 meters (6'-6" into the air). 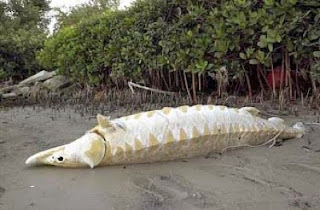 In China, arowanas are known as alœdragon-fishal due to their appearance, and they are thought to be harbingers of good luck. This deep sea predator, one of the most primitive sharks alive today, is a relic from the Cretaceous period, when dinosaurs ruled the Earth. Seldom seen alive, and only recently filmed for the first time, the frilled shark can grow up to 2 meters (with females being larger than males) and they live in deep waters, where they feed mostly on squid. 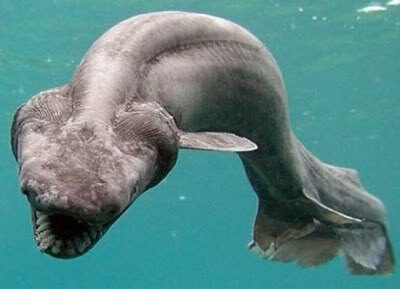 They are not dangerous to humans, and as a matter of fact, most frilled sharks spend their whole lives without seeing a human being. Only dead or dying specimens are usually seen and recorded by fishermen or scientists. A close relative to the arowana (see #8), the Amazonian arapaima is sometimes considered to be the largest freshwater fish in the world. According to early descriptions, it could grow up to 4.5 meters (14'8") long, but today, enormous individuals like these are seldom found and most adult arapaimas average 2 meters (6' 6") long. These slow moving predators feed on smaller fish, crustaceans and whatever small animal they can fit in their mouth. An interesting trait of this fish is that it needs to breath oxygen from the air, like a cetacean, in order to survive. Arapaimas pose no danger to humans and are often hunted for their meat; unfortunately, they are very scarce nowadays. 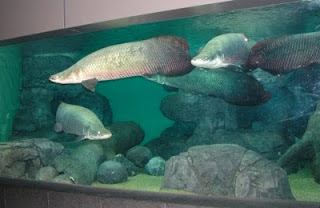 Although the arapaima seemingly appeared in the Miocene period, it belongs to a much older family, the Osteoglossidae, and therefore its origins can be traced back to the age of dinosaurs. This critically endangered animal is a survivor from the Cretaceous period, and can be found both in saltwater or in rivers and creeks, and has been found up to 100 kms inland. Up to 7 meters (23') in length, sawfish may look like sharks but are actually more closely related to rays. Their alœsawal is both a weapon and a sensory organ, covered on electro-sensitive pores which allow it to sense prey despite its terrible eyesight. Although usually peaceful, the sawfish can become extremely dangerous if provoked. Due to an extraordinary fossil, we know that gigantic, prehistoric sawfish were probably a staple food for the largest carnivorous dinosaur, Spinosaurus, as a vertebra from the fish was found stuck between the dinosaural teeth. This formidable, thick scaled predator is found in the southern US and northern and eastern Mexico, being the largest freshwater fish in North America (although it sometimes wanders into the sea). It can grow up to 4 meters (13') long and weigh up to 200 kgs (440lbs). Gator gars are so called because of their reptilian appearance and long jaws, armed with a double row of sharp teeth. 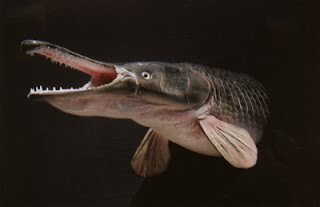 They are voracious ambush predators and have been known to bite humans on occasion, although no confirmed deaths due to alligator gars have been recorded to date. Gars are among the oldest fish alive today; their origins can be traced back to the Cretaceous period. These african fish are often called alœdinosaur eelsal , due to their reptilian appearance and serrated dorsal fin, reminiscent of some dinosaursal spiked backs. 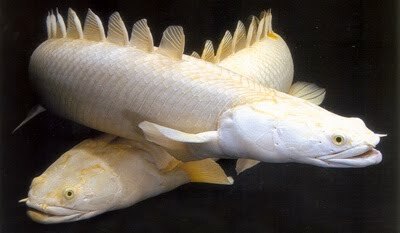 They are not really eels, but members of the bichir family. Bichirs were already around in the Cretaceous, so the alœdinosaural part of their name is actually fitting in a way. 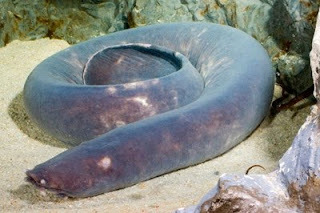 Although often sold as exotic pets, dinosaur eels are prone to escaping their fish tanks. They can survive out of the water for long periods of time as long as their skin remains wet, which enables them to wander far away from their tank. The Coelacanth is the most famous of all alœ living fossilsal and deserves to be #1 in this list, because it is the best example of a aloe Lazarus taxonal , this is, animals that were supposed to be long extinct and are unexpectedly found to be alive. Coelacanths were supposed to have become extinct in the Cretaceous period, along with the dinosaurs, but in 1938, a live specimen was caught in South Africa. Since then, more specimens have been seen and photographed, and a second coelacanth species was even found in Indonesia in 1999. Coelacanths are large predators, up to 2 meters (6-'6") long; they feed on smaller fish, including small sharks, and are usually found in deep, dark waters. 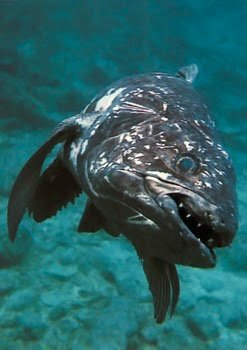 Although rarely captured and consumed due to their horrible taste, coelacanths are critically endangered nowadays.